Essentially a love letter to the famous British primatologist Jane Goodall, Lorenz Knauer’s JANE'S JOURNEY begins with an interesting story. Vintage footage and compelling narration by Goodall recount her privileged and relatively carefree girlhood in London. Given the gift of a stuffed chimpanzee named Jubilee by her often-absent father, young Jane dreamed of one day traveling to Africa – an ambition unheard of for girls in the 1940s. But travel to Africa she did, fortunately linking up with the famous anthropologist Louis Leakey, who was seeking a chimpanzee researcher. In 1960, the 28-year-old Goodall, accompanied by her mother for reasons of safety, went to Gombe Stream National Park in Tanzania to study chimp social and family behavior. She lived, quite happily, among the chimps at the preserve, where she met and married her first husband, Dutch nobleman and wildlife photographer Hugo van Lawick, and raised their young son among the Tanzanian chimpanzees (the child was sometimes kept in a cage to protect him from wayward chimps). Goodall’s unorthodox methodology (giving the chimps names, like “David Graybeard” and “Goliath” rather than the numbers commonly assigned in such research) raised eyebrows in the academic community, but her studies led to some important discoveries: that chimpanzees made and used tools (a stick to “fish” for termites), challenging the previously held belief that toolmaking is the sole province of man; and that chimpanzees, previously thought of as peaceable vegetarians, have an aggressive side and will hunt and eat smaller primates. Goodall recalls how unusual it was for a person without a degree to conduct this research; as it happens, Goodall a few years later earned a Ph.D from Cambridge (without first having to obtain a bachelor’s or master’s degree). While the film focuses on these recollections, enhanced by fascinating vintage photographs and footage, it promises a compelling experience. Unfortunately, the proceedings all too soon shift into full-bore hagiography, becoming a plodding and worshipful account of Goodall’s present-day activism. More than twenty years ago, Goodall was awakened to the importance of preventing animal exploitation, and has since become involved with combating global warming and a host of other environmental and social justice causes. 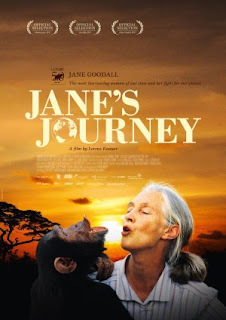 At 77 (75 at the time of filming), Goodall is a literally tireless advocate, logging untold hours and carbon-producing miles on behalf of the Jane Goodall Institute and her global youth organization, Roots & Shoots.